“Symmetries of Culture – Theory and Practice of Plane Pattern Analysis” by Dorothy Washburn and Donald W. Crowe; University of Washington Press, Seattle and London. 1988, third printing 1998. I have been preparing for my upcoming design workshop on Saturday and my research repeatedly takes me to my library. On one such excursion “Symmetries of Culture” literally jumped out at me and I felt compelled to spend some quality time with an old friend. This book is aimed at non-mathematicians. With the excellent historical information it is easy for the the reader to be mesmerized by patterns and their breakdown. Anyone studying art history has become aware of recurring symmetrical patterns of form and color in ancient, tribal, fold and the applied arts. At the same time, anthropologists are actively applying ‘symmetry analysis’ in their research to explain how artworks reflect pattern of human behavior and basic values. 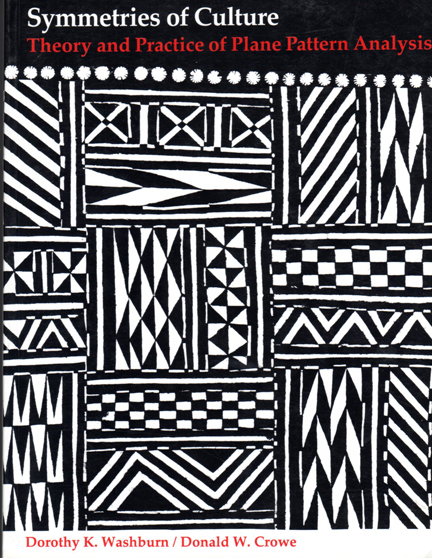 “Symmetries of Culture” richly illustrates, in word as well as in imagery, intriguing examples of symmetrical designs found across all cultures, whether we examine an English quilt, a Zulu loin cloth, Japanese chopstick case or Native American basketry containers. In more recent history we can identify similarities of Escher’s fantastical drawing of interlocking lizards to a Fijian basket lid and an Egyptian wall mosaic. I purchased this book for my library in 1999 and at that time the cost was US $ 50 which made the book a true investment. I have referred to it regularly and because I have it on my library shelf it is readily accessible to answer pattern related questions in an instant. If you are interested: The book is still available and I have found it during an online search for just under US $ 45. I highly encourage you to check with your library and see if they can obtain a copy. 21 Feb	This entry was published on February 21, 2012 at 7:22 am. It’s filed under Art, Book Review, Design, History and tagged applied arts, art & design, art history, book review, design & mathematics, design history, folk history, Plane Pattern Analysis, research, Symmetries of Culture. Bookmark the permalink. Follow any comments here with the RSS feed for this post. Older: Challenge Yourself – Improve Your Creative Space! Go for it – blogging is all about networking and I appreciate the feedback! It looks like a good thing to investigate. Found Symmetries used on the Amazon website for $13.00 plus shipping. I assume if you go to other used book sites like alibris it can also be found for about the same amount. Thanks Alice, Very helpful information for those of us watching our finances! Another reader just sent me this link providing an excellent example of the book. Several images are provided in color which is a wonderful bonus. Enjoy, everyone!